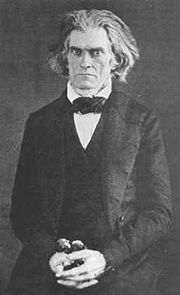 John Caldwell Calhoun (March 18, 1782 – March 31, 1850) was a leading United States senator, vice president, and political philosopher from South Carolina during the first half of the nineteenth century. Calhoun was an influential spokesman for slavery, nullification, and the rights of electoral minorities, such as slave-holders. His ideas helped lead to the American Civil War a decade after his death. Calhoun began his career as a staunch nationalist, favoring war with Britain in 1812 and a vast program of internal improvements afterwards. He reversed course in the 1820s to attack nationalism in favor of states rights of the sort Thomas Jefferson had propounded in 1798. Although he died before the Civil War broke out, Calhoun was a major inspiration to the secessionists who created the short-lived Confederate States of America. Nicknamed the "cast-steel man" for his staunch determination to defend the causes in which he believed, Calhoun pushed the theory of nullification, an argument that states could declare null and void any federal law they deemed to be unconstitutional. He was an outspoken proponent of the institution of slavery, which he defended as a "positive good" rather than as a necessary evil. His rhetorical defense of slavery was partially responsible for escalating Southern threats of secession in the face of mounting abolitionist sentiment in the North. Although best known as a defender of slavery and a Southern partisan, Calhoun was among the nation's most important political theorists. His Disquisition on Government (1849) examined basic principles of sovereignty and personal liberty in the model of Aristotle's Politics or Montesquieu's Spirit of the Laws. It remains one of the most trenchant defenses of limited government and minority interests, while, ironically, providing philosophical justification for the denial of rights of Southern slaves. John Calhoun was the son of Scots-Irish American immigrant Patrick Calhoun. When his father became ill, the 14-year-old boy quit school to manage the family farm in South Carolina. But he eventually returned to his studies, earning a degree from Yale College in 1804. After studying law at the Tapping Reeve Law School in Litchfield, Connecticut, Calhoun was admitted to the South Carolina bar in 1807. In January 1811, Calhoun married his first-cousin-once-removed, Floride Bonneau Colhoun. The couple had ten children over an 18-year period, although three died in infancy. 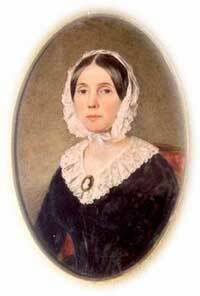 During her husband's second term as Vice President, Floride Calhoun was a central figure in the Petticoat Affair. In 1810, Calhoun was elected to Congress, and became one of the War Hawks who, led by Henry Clay, agitated for what became the War of 1812. After the war, he led a Bonus Bill for public works. With the goal of building a strong nation that could fight a future war, he aggressively pushed for high protective tariffs (to build up industry), a national bank, internal improvements, and many other policies he later repudiated. In 1817, President James Monroe appointed Calhoun to be Secretary of War, where he served until 1825. His opponents were the "Old Republicans" in Congress, with their Jeffersonian ideology for economy in the federal government; they often attacked the operations and finances of the war department. Calhoun was a reform-minded executive, who attempted to institute centralization and efficiency in the Indian department, but Congress either failed to respond to his reforms or rejected them. 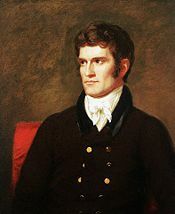 Calhoun's frustration with congressional inaction, political rivalries, and ideological differences that dominated the late early republic spurred him to unilaterally create the Bureau of Indian Affairs in 1824. Calhoun originally was a candidate for President in the election of 1824, but decided to become the running mate to both John Quincy Adams and Andrew Jackson. Thus while no candidate received a majority in the Electoral College and the election was ultimately resolved by the House of Representatives, Calhoun was elected Vice President in a landslide. As his election was separate from that of Adams, who he believed unfairly favored Northern interests, he was not considered part of the administration and the two feuded frequently. In 1828, he ran for reelection as the running mate of Andrew Jackson, and thus became only the second Vice President to serve under two presidents—George Clinton was vice president during the administrations of Thomas Jefferson and James Madison. Under Andrew Jackson, Calhoun's vice presidency remained controversial. As with Adams, a rift between Northern and Southern views drove a wedge between Calhoun and his president. The Tariff of 1828, also known as the Tariff of Abominations aggravated the rift between Calhoun and the Jacksonians. He had been assured that Jacksonians would reject the bill, but the Northern Jacksonians were primarily responsible for its passage. Frustrated, he returned to his South Carolina plantation to write South Carolina Exposition and Protest, an essay rejecting the nationalist philosophy he once advocated. He now supported the theory of concurrent majority through the doctrine of nullification—that individual states could override federal legislation they deemed unconstitutional. Nullification traced back to arguments by Thomas Jefferson and James Madison in writing the Kentucky and Virginia Resolutions of 1798, which proposed that states could nullify the Alien and Sedition Acts. Jackson, who supported states rights, but believed that nullification threatened the union, opposed it. The difference, however, between Calhoun's arguments and those of Jefferson and Madison, is that Calhoun explicitly argued for the state's right to secede from the Union if necessary, instead of simply nullifying certain federal legislation. In 1832, the states rights theory was put to the test in the Nullification Crisis after South Carolina passed an ordinance that claimed to nullify federal tariffs. The tariffs favored Northern manufacturing interests over Southern agricultural concerns, and the South Carolina legislature declared them to be unconstitutional. In response, Congress passed the Force Bill, which empowered the president to use military power to force states to obey all federal laws, and Jackson sent U.S. Navy warships to Charleston Harbor. South Carolina then nullified the Force Bill. But tensions cooled after both sides agreed to the Compromise of 1833, a proposal by Senator Henry Clay to change the tariff law in a manner which satisfied Calhoun, who by then was in the Senate. During the Nullification Crisis, President Jackson said in a famous toast, "Our federal Union—it must and shall be preserved." In Vice President Calhoun's toast, he replied, "The Union; next to our liberty most dear!" The irony in this is that Calhoun argued for the Doctrine of Nullification, which had gone as far as to suggest secession, anonymously, making his true opinions unknown to Jackson. The break between Jackson and Calhoun was complete, and, in 1832, Calhoun ran for the Senate rather than remain as Vice President. Calhoun led the pro-slavery faction in the Senate in the 1830s and 1840s, opposing both abolitionism and attempts to limit the expansion of slavery into the western territories. He was also a major advocate of the Fugitive slave act, which enforced the co-operation of Free States in returning escaping slaves. 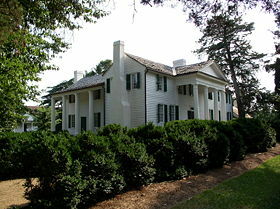 Calhoun's home, Fort Hill, in Clemson, South Carolina. After a one year break as Secretary of State, Calhoun returned to the Senate in 1845, participating in the epic Senate struggle over the expansion of slavery in the Western states that produced the Compromise of 1850. Even though his health was deteriorating he insisted on protesting the compromise. He died in March 1850, of tuberculosis in Washington, D.C., at the age of 68, and was buried in St. Phillips Churchyard in Charleston, South Carolina. Calhoun's legacy as one of the leading defenders of slavery in American history made him a highly controversial figure. On the other hand his original and articulate argument in defense of minority rights became the legal basis of much of the civil rights movement. 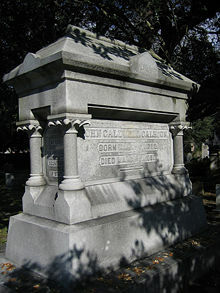 Calhoun's grave in Charleston, South Carolina. 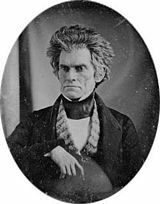 History of "John C. Calhoun"
This page was last modified on 14 May 2018, at 20:28.